By Angela Dunne, J.D. and Susan Ann Koenig, J.D. Angela Dunne, J.D., Susan Ann Koenig, J.D. 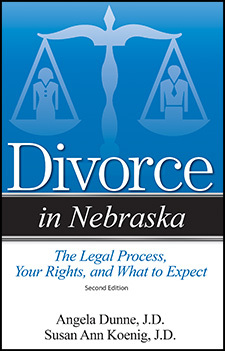 Are You Getting a Divorce in Nebraska? Fortunately attorneys Angela Dunn and Susan Ann Koenig understand your need to know. During their combined forty years of practicing law, they has helped hundreds of individuals navigate the maze of divorce. In Divorce in Nebraska they answer not only the questions on your mind but also those you may not have thought to ask. What is the mediation process and does Nebraska require that my spouse and I go through it? How quickly can I get a divorce in Nebraska?